Body Active Formula Body Lotion with Marine Extract that leaves the skin feeling light and silky smooth. Locks in moisture and improves the skin’s elasticity. Contains vitamin B3 Niacin – a natural vitamin supplement for your skin. A gentle liquid make-up remover that dissolves foundation, blush, mascara and lipstick. Contains moisture-retaining Marine Extract. Fortified with Vitamin E – a natural vitamin for your skin. Gentle and mild for your face and eyes. Stimulates your skin while removing make-up and impurities. Contains moisturising Marine Extract and Vitamin E – a natural vitamin that strengthens and repairs the skin. Use: Apply skin tonic to a cotton wad and clean the skin. For use before applying makeup or during the day to keep your skin clean and fresh. 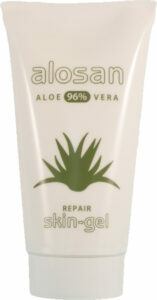 Alosan Skin Gel with 96% ALOE VERA, for all skin types. Nourishing skin gel to prevent the skin from drying. Cooling and soothing after exposure to sun, ideal for sunburn, slight grazes and sores. A universal product for all over use. 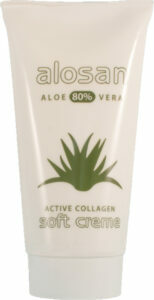 Alosan Soft Crème with 80% ALOE VERA, a nourishing cream med Active COLLAGEN to energise the skin. The cream regenerates your skin and protects its natural moisturising balance, leaving your skin smooth and silky-soft. 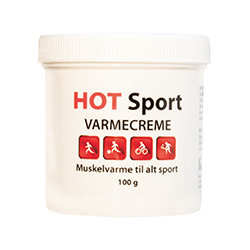 Soothing heat cream for sore muscles and joints. Apply – massaged into the skin. NB. The heating effect will disappear after 3-4 hours. Do not use if you have sensitive skin. Mint Oil is an oil which can be used during both muscle pain and insect bites. Scroll oil around the measures point, repeat the treatment 3-6 times. Mint Oil anesthetize the skin so annoying itching is reduced / avoided. Mint Oil relieves muscle pain, both before and after a sports performance.